Huawei has revealed its first ever Arm-based server CPU, the Kunpeng 920, which it says will deliver higher performance per watt than mainstream chips. Based on the ARMv8 architecture, the 7nm Kunpeng 920 comes with 64 cores and operates at 2.6GHz, with eight channels of DDR4 memory. It supports RDMA over Converged Ethernet (RoCE) network protocol, PCIe Gen 4 standard and Cache Coherent Interconnect for Accelerators (CCIX) architecture. Designed for use in big data, distributed storage and for powering native Arm applications, Huawei says the silicon scores 25 percent faster on the SPECint benchmark, with a power efficiency that is 30 percent better than comparable alternatives. Huawei is not new to designing microprocessors, having worked with the Arm architecture for years to produce the Kirin chips used in its smartphones, through fully-owned subsidiary HiSilicon. In 2018, the company became the second largest smartphone manufacturer in the world, surpassing Apple. 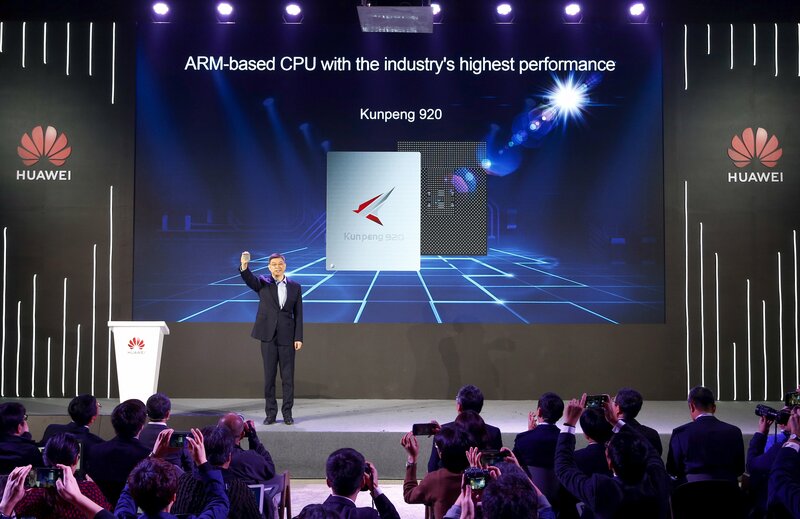 Huawei also announced a series of servers powered by the Kunpeng 920, called TaiShan. Available in three models, they are designed to focus on either storage, high-density compute, or a combination of both. “Today, with Kunpeng 920, we are entering an era of diversified computing embodied by multiple cores and heterogeneity. Huawei has invested patiently and intensively in computing innovation to continuously make breakthroughs. We will work with our customers and partners to build a fully connected, intelligent world,” said William Xu, chief strategic marketing officer at Huawei. He promised that Huawei will work with global partners to drive the development of the ARM ecosystem and embrace a “diversified computing era”. The company also took pains to emphasize its continued commitment to the x86 platform. In the announcement, Huawei referred to its strategic partnership with Intel on x86 processors and emphasized that the “long-term” cooperation will continue. No pricing or launch dates were announced for the new products. The news of a new CPU follows recent reports that Qualcomm - another chip designer with a successful line of smartphone silicon and plans for servers - has essentially shut down its data center division, improving Huawei's prospects in this market, but also indicating potential challenges ahead.